I love my copy to death. Truth is a bad boy, serial killer tune. Bought this vinyl on sight for this tune alone. Very rugged production values, highly artistic endeavor. The truth is there for eyes to see! This has just been repressed btw Sister Ray have a copy or two. Absolutely wicked 5 track EP. All tracks are proper junglistic mayhem! Track B2 does however sound pretty distorted on my copy, but perhaps played with a better stylus, it might sound better - this is the only negative on an otherwise perfect release. I think my favourite is actually A1, the chopping of the Amen is almost mesmerising! Recommended! This release is so massive, it's beyond expression. So here's the deal: This record was only available through Discogs and were put up by Persian himself subsequently. That means, that you had to check back this release page every few days from February to early April 2015 to get a copy. Persian was a good guy and put them up at different times, so that chances were actually quite good for everyone interested to grab a copy. The price was set to about €14. According to Persian he put up 70 for sale on Discogs, so i guess no more than 100 copies exist. The tunes themselves are superb! Starting off with a collaboration with Bizzy B and DJ D-Lux, classic just screams, well, "Classic". This sound a lot like a late Brain Records/early Joker release with its wobbly bassline, ragga vocals, mad machinegun amens and a sparse piano sample thrown in between. "Dub Fi Dub" is a bit faster and more aggressive, but treads in the same light as "Classic". Ragga vocals interchange with a female vocal sample that goes "Oh baby, can't you see/all the crazy things that you do to me." Both tune will please most people and is probably the selling point for everyone interested in some classic jungle, but the B-Side is the winner for me! "Persian Sound" features Sevi G's live vocals over a rolling "Soul Pride" over classic riddim before breaking down to the "Sleng Teng Riddim" with the "Ring The Alarm" interpretation from Sevi G.
"Pumpkin Dubplate" is the winner for me. I don't know why, because this one is a bit conservative in terms of beat workout. A simple but rolling two-step beat and classic breaks put over Tenor Saw's "Pumpkin Belly" (which uses the Sleng Teng riddim too!) and some vocal samples thrown in for a good measure. ("...playing this bloody jungle music all night!" ;)) This one seems to be the newest tune off all 5 (I guess this was made in late 1995). My favorite off this release and just pure fun! 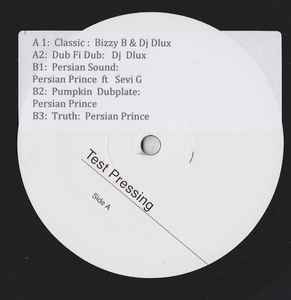 "Truth" is a classic 1994 jungle release with it's reverse bassline à la Dread Bass. Classic Amen/Think/SeameStreet(Helicopter) combination this one for the jungle connoisseurs! Unfortunately Pumpkin Dubplate suffers from a degraded Dub source and looses a bit of its energy when getting glitchy at the end of the tune. All other tunes sound a lot better, than the given the impression from the description. I can't complain about the other tunes and there are a lot worse mastered tunes out there! Again, I can't stress out more, that this release is a real gem and definitely worth listening to (and of course getting played out loud!). Vintage unreleased jungle from three legendary producers. Do yourself a favor and try to get this - you won't be disappointed! Absolute pure class 12" this one......Nice solid sounding vintage press. Bigups the Persian and all the Existence Is Resistance crew. I'll be rinsing this one. Show your support for artists buy copy for your collection !